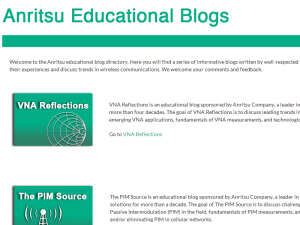 Anritsu offers an educational series of informative blogs written by well-respected industry leaders who share their experiences and discuss trends in wireless communications. The goal of Base Station Transmits is to discuss challenges faced by engineers and technicians who must optimize todayÃƒÂ¢Ã¢â€šÂ¬Ã¢â€žÂ¢s wireless networks. Topics include antenna systems, backhaul testing, interference, and meeting key performance indicators (KPIs). The goal of PIM Source is to discuss challenges in locating and testing Passive Intermodulation (PIM) in the field, fundamentals of PIM measurements, and methods of preventing and/or eliminating PIM in cellular networks. The goal of Interference Hunting is to provide readers with cost- and time-efficient processes to determine if interference is causing a problem, locate its sources, as well as offer practical tips on measuring interference to optimize wireless network performance. Solid Signals focuses on trends and news in land mobile and specialized mobile radio technology, LMR spectrum policy, public safety, and commercial radio technologies. We welcome comments, feedback, and invite you to join us in discussions about the LMR, SMR, and PMR markets. The goal of VNA Reflections is to discuss leading trends in vector network analysis, emerging VNA applications, fundamentals of VNA measurements, and technological advances in VNAs.